Hygge and why are the Danes so happy? Denmark is the happiest country on earth and if you think it’s because of their healthcare system or a substantial gross domestic product (GDP) per capita, a high life expectancy, social support, freedom, generosity and less corruption than some countries - then you are right. They do. They also have something else that we discovered a while ago but it is so aligned with the notion of slow, we simply had to tell you about it. The Danes, aside from their fabulous butter cookies, have something that a lot of us do not. They have the notion of hygge, which sounds a lot like "hoo-guh", which, in turn, sounds a lot like a cave man with a slight Irish lilt demanding a hug. Hygge is the idea of going slow in the winter time, which theoretically is something we all feel like doing but fight internally. Hygge is roughly translated to mean "cosiness" (in German: Gemütlichkeit). After all, it gets light late and dark early for five months out of the year in Denmark, yet they aren't SAD from all that light deprivation (afflicted with Seasonal Affective Disorder). They are HAPPY, thanks to the mental state of hygge. Hygge says to embrace that which is; accept the darkness and leverage it to create a cosy atmosphere by lighting candles, slow down, go within and reflect. Celebrate the now, give yourself what you need - a visit to the sauna, healthy vitamin-rich food, warm meals, a fire in the fireplace, a hot water bottle at night, heat. Morning rituals in the winter time are different than in the summer time. Slippers and a bathrobe, a hot cup of coffee and warm food create a sense of nurturing to offset the piercing cold. Reminding ourselves to be grateful for what we have can provide the necessary mental shift to get through the long winter months. Warmth is not only a physical state, it's a mental and the Danes figure snow and ice will slow you down so why rush? Light a Candle and embrace the oncoming long cold Winter nights. 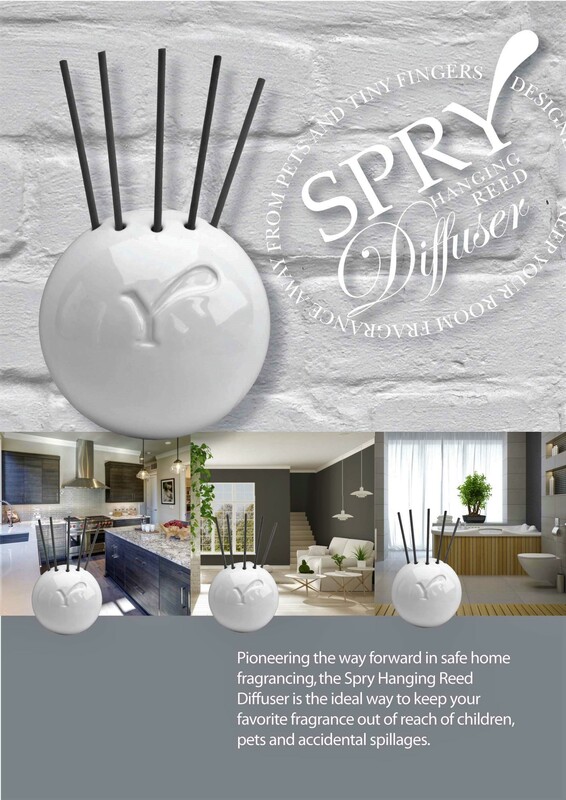 No need to worry about spillages or the best position for a Diffuser, Spry have now launched the Wall Hanging Diffuser so you can now spread your favourite scents throughout the entire house. If you would like to purchase a Wall Hanging Diffuser pleaseemail us.